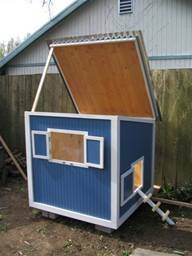 I just wanted to share the henhouse I built. It’s in the backyard behind the garage. 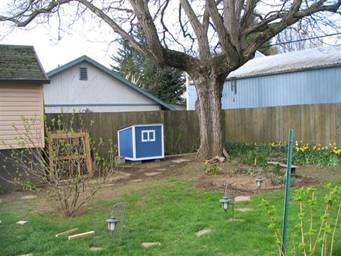 We’ll be adding on a fenced run that will extend off of the right side of the henhouse behind the tree. It’ll be covered to keep them out of the rain and we’re sowing some fresh grass for them to munch on. With the run, they’ll be able to go in and out as the please without fear of raccoons. 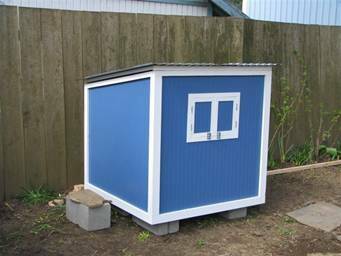 The henhouse is about 4 feet cubed. 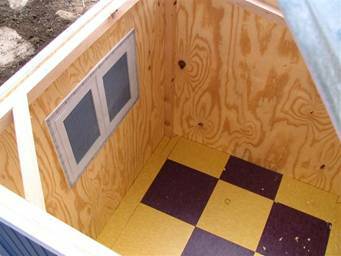 We installed a window for ventilation and an easy-access chicken door. It took about 5 weekends to build. It’s bare inside right now, but we will install a nest box and a roost when they get a bit older. Structurally, it’s just plywood and beaded plywood framed with 2 x 2’s. There are corner braces at the top for stability. The trim and 2 x 2 frame sandwich the plywood and I caulked all the seams for weatherproofing. The chicks just moved in tonight (they’ve been getting a little stinky in the house). Sweet dreams! 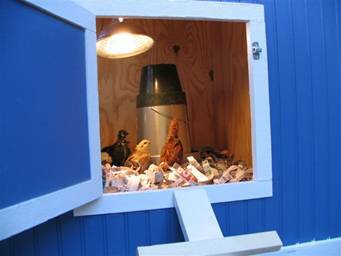 "cute as a chick house-adults need more room, roost"
In my opinion I think this would make a great brooder, with more ventalation added. As for adult chickens, they would be a little crammed unless there are only like 2 in there. But it is very strongly built it looks like. This is like the new one that we are going to build for our new gals! Nice to see your pics! great coop! The coop looks great! I'd love to see it updated with the nest boxes and roost you mentioned. I just love your coop design. I have been looking for one that would be good for a flock of silkies and this one fits the bill. Thanks for posting.